← benches in the park for hugging? 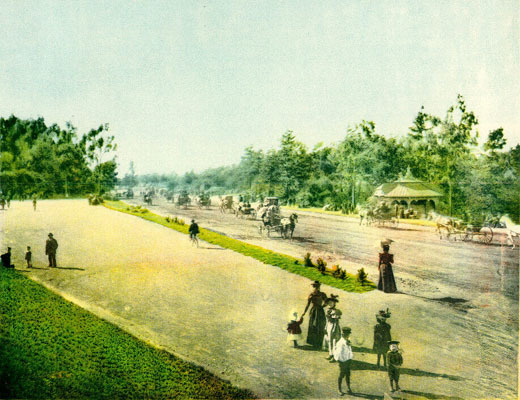 Stories about ghosts seem to haunt public parks. In Chapultepec Park in Mexico City, La Llorona (The Weeping Woman) is said to wander through the ancient forest, exiled from heaven and eternally weeping for her drowned children and her lover. “There they were, just as the man had said they would be, just as they were almost every night: two brown boots. In Central Park. On Monday. At midnight. Alone. 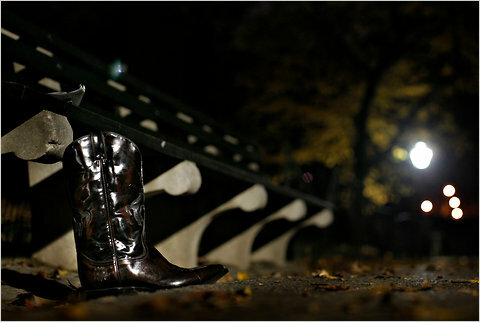 It was an eerie sight, the two patent mahogany-colored cowboy boots resting neatly by a green park bench in a pale wash of lamplight. According to local dog walkers, they sit there most nights, and have for years. The Floridian November night and the fact that “Law & Order” plot lines no longer lurk behind the trees made the park a place for a perfect after-dark jaunt. Past sleeping sphinxes and the Temple of Dendur at 84th Street off Fifth Avenue, the park had gone to the dogs: free roaming pets reveled in the absence of leash laws that loosen after 9 p.m.
Lucky, a mixed breed, found the boots that night. He had a red LED light on his collar and glowed like a little Rudolf, prancing staglike around his owner, Marcus Giancaterino, a banker who had heard of the boots — though he had never seen them — from other night dog walkers. Park lore said the pair belonged to a man who lay moray-like in a bush, waiting to pounce on whoever touched the glossy shoes. For some reason, Nocturnalist decided they were worth a visit. Mr. Giancaterino led the way, saying he doubted the boots’ existence. Midsentence, there they were, incongruous in a nightscape of crumpled leaves and Himalayan pine whose needles drooped like Spanish moss. via Central Park Ghost Boots – Nocturnalist – NYTimes.com. “The legend states that there was once a police officer that patrolled Golden Gate Park. Little is known about who he/she is except that the officer died over ten years ago. The ghost still remains in Golden Gate Park to this day. There have been various sightings of the so-called, “Ghost Cop.” There have been no reports stating that the spirit is dangerous but be wary. The spirit can be drawn out in various ways including speeding along the roads, not having headlights on, and parking in designated zones that do not permit parking. This author does not encourage readers to attempt to draw out the ghost through these ways, as they are both illegal and dangerous. Indeed, the tickets for committing those crimes are rather expensive . . .
via Ghost of Golden Gate Park – San Francisco Tourism | Examiner.com. This entry was posted in "lost" golden gate park, legends, people. Bookmark the permalink.